Bhubaneswar:8/11/18 :The youth and students’ wings of Biju Janata Dal (BJD) staged agitation in front of different central public sector undertakings (PSUs) in Bhubaneswar today over the unfulfilled promises made by the Central Government for providing employment to youths. 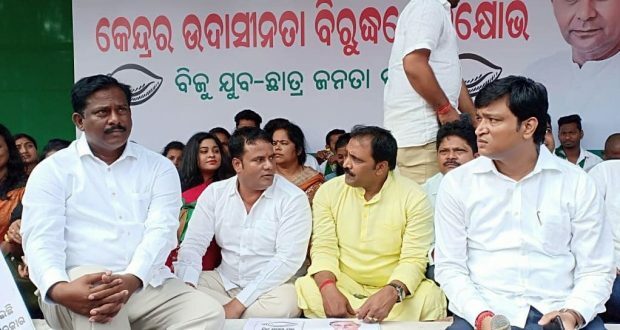 Different teams of BJD staged dharna in front of National Aluminium Company Limited (NALCO), Indian Oil Corporation Limited (IOCL), Mahanadi Coalfields Limited (MCL) and Rail Sadan. The BJP has forgotten its election manifesto and it will no more be able to gain power, he added. Next: General election to the Legislative Assemblies of Chhattisgarh, Madhya Pradesh, Rajasthan, Mizoram &Telangana, 2018 – Ban on Exit Poll.